Now that you have checked your recording settings and have returned to the recording window we can start preparing to record. In the screenshot below you can see a big red “Start Recording” button, two screen icons, a microphone icon and the “Manage” button. When one of the icons is grayed out with a slash through it, this means that option has be turned off to setup that option you will first have to turn it back on. By pressing on each icon (screens or microphone) you can turn that recording option on or off. Pressing the ˅ button next to each individual recording option will open a pull down menu with input options. Please press the ˅ button next to the first screen icon to the left. 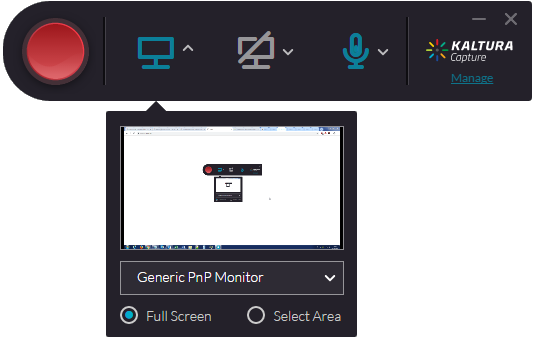 This opened a pull-down window with your primary screen selected and set to record full screen (if you have multiple screens attached to your computer, the primary screen is the one with the Windows taskbar). 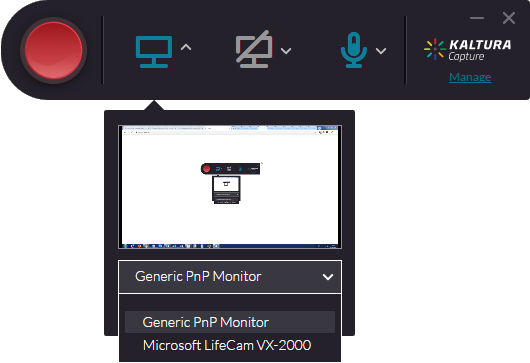 When you click on “Generic PnP Monitor” (or the first entry listed if it is not similar to our example) you will get another pull-down with available recording options. If you wish to record your webcam/camera on this option, please select it. If you wish to record your screen you can choose to either record it full screen or to make a partial recording (you can verify that this is the screen you want to record by watching the small preview window in this pull-down menu). 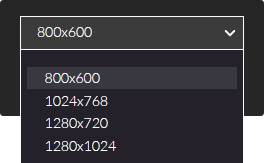 When you wish to record a part of your screen you can click on “Select Area”. This will open a new window (see screenshot). In this new window you have another pull-down menu to select the size of the recording area. 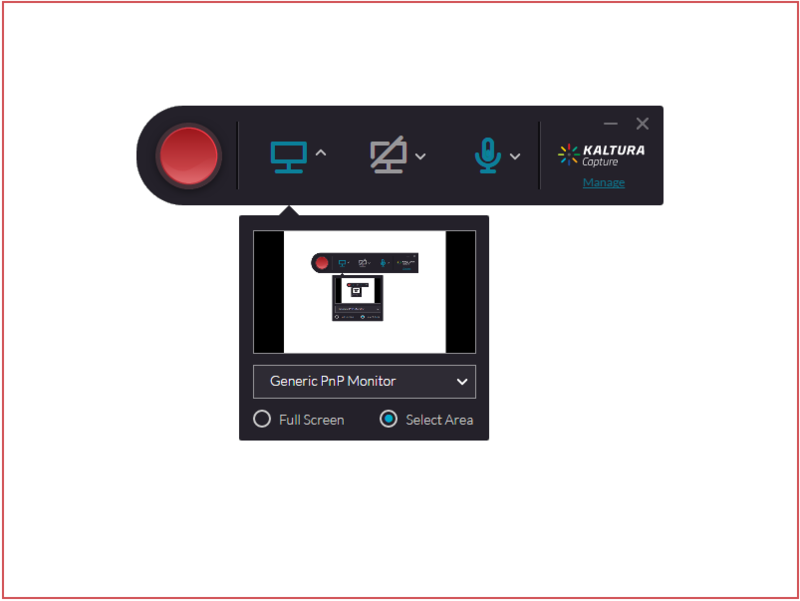 When you have chosen your recording area, press confirm to return to the recording window which will now also show a red border surrounding it in the size you selected. Repeat these steps for the second screen recording option, this screen would normally be used as the output for your Microsoft PowerPoint presentation! When recording presentations you have to have the ability to edit the presentation. If you cannot edit it it is opened with “Protected view” (see screenshot below). When you see a presentation was opened in “Protected view”, please press the white “Enable Editing” button to enable recording the PowerPoint slides as chapters in your recording. For the last recording option (the microphone icon), we get to choose which input to record from if there were multiple microphones connected.